We would like to inform you that BakuBus LLC has launched an express bus service from Heydar Aliyev International Airport to the City Center. Comfortable buses operate the express route 24 hours a day, 7 days a week. 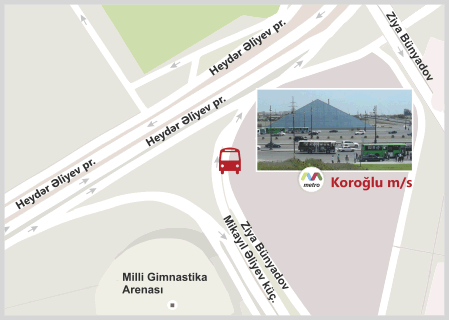 The buses run from the airport to 28 May metro station and vice versa without intermediate stops, with a one-minute stop near Koroglu metro station. The buses depart every 30 minutes. To use the BakuBus bus service, please approach the bus stops located at the exits of the first and the second terminals. On the 29 November - 2 December, the exhibition will be open to industry specialists and persons working in related fields. Students and persons under 17 years of age will be able to visit the exhibition on 2 December only. Persons under 17 years of age only accompanied by parents will be able to visit the exhibition. There is a children's area at the exhibition where your children can be trusted to the professionals Agil and Bilgi who will take care of your children as well as entertain them with useful and exciting activities. These funny guys have caught the fancy of the children and parents for their interesting and unusual projects and fascinating excursions. Entry to the exhibition is permitted to those with an invitation or those who registered on our website and received an electronic pass to the exhibition. Important: Do not forget to bring your invitation card on which your individual barcode for entry to the exhibition is printed. This barcode includes data about you which is required during registration. Having this barcode will allow you to take advantage of FAST TRACK SERVICE, which will considerably speed up the registration process.